Description: Waiting for the diamond to clear. Notice the CNW caboose! Description: UPY 1390 and 1392 take their train of all boxcars out of Dolton. Description: Leaving UP Salem heading south. Description: Looking like it was in a dog fight and lost is this Union Pacific switcher waiting to enter the UP mainline from its run to the Innophos Waterway plant on this April day. 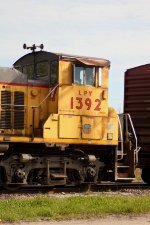 Description: Not sure, is that "LPY 1392" or "UPY 1382"??? Could "LPY" stand for "Lumpy"??? Description: The short line of boxcars and tankers wraps around the curve to the Innophos Waterway plant. Description: Bet this was a sharp looking unit when new, now it's battle scarred but still plugging away! Description: Maybe someday it will hit the paint shop again . . . and there again, maybe it won't. Description: going to get a cut of spine cars. Description: Working the Dupo, Illinois yard. Title: A through the wind sheild shot. Description: UPY 1392 pushes some UPS containers across a RR crossing with the lights out at UP's Dupo Illinois yard.